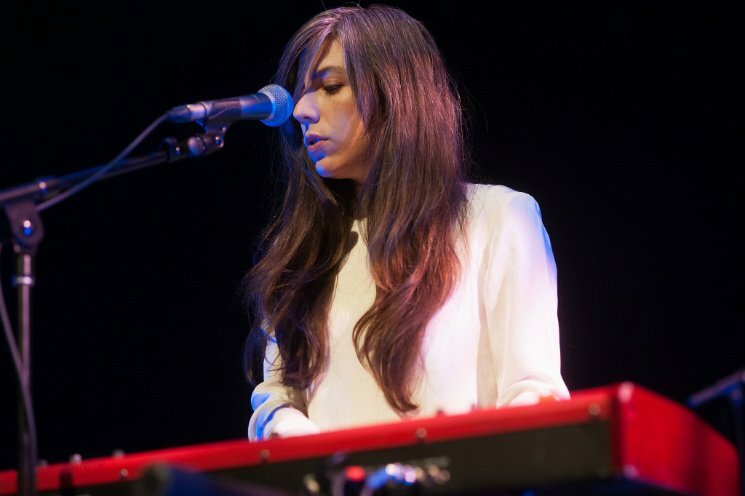 After three opening acts, the much-anticipated Julia Holter and her band took the Theatre Junction Grand stage to a packed house last night (June 23). Holter played keyboards and sang with gusto, accompanied by a viola player, drummer and upright bassist. Her orchestral pop enthralled, as the band performed songs from 2013's Loud City Song and 2015's acclaimed Have You In My Wilderness. The set varied with performances of "So Lillies" from her debut album, Tragedy, as well as a cover of "Don't Make Me Over" by Dionne Warwick. Experimentation abounded, the band members utilizing all sorts of instruments, from chimes to laptops and loop pedals. Holter joked with the crowd about her "real harpsichord" (the setting on her keyboard) and her past Calgary show, four years earlier. The music often felt like a waterfall of sound, drums tumbling underneath Holter's pointedly enunciated vocals on songs like "Silhouette." Her vocal tone and the viola combined with soft drums to cinematic effect, mesmerizing the audience. "Horns Surrounding Me" was one of the strongest moments of the performance, its marching tempo buoying Holter's soaring vocals. In carving out her own space — somewhere between orchestral pop, folk, electronic and avant-garde music — Holter has truly come into her own.